Health provision under the new Health Secretary Matt Hancock. More of the same lies, fudges, and patient safety in jeopardy. Like all recent Conservative health secretaries, Matt Hancock likes to dress up money saving schemes, cuts and privatisation-by-stealth, as benign patient focused initiatives. While no one at Keep Our NHS Public would argue against effective alternatives to drugs and hospital treatments, his proposals must be viewed in a wider context of devastating underfunding, mismanagement and privatisation of the NHS and the wider landscape of nearly a decade of crippling austerity. On Monday 5thNovember Health Secretary Matt Hancock set out in a speech to health think-tank The Kings Fund his ideas for social prescribing, asserting that “prevention is better than cure”. ‘Social Prescribing’ has existed in the NHS since the 1990s, with over 100 schemes already in operation. The logic has been that a clinician could refer to or suggest non-medical activities such as dance lessons or art classes to aid a patient’s recovery in certain circumstances. In July 2018 £4.5m was pledged for 23 social prescribing projects across England concentrated in the voluntary sector. However this money, and the reach of the organisations included is scant when compared to the scale of the current NHS crisis. Libraries and activities hosted by them, are often among the suggestions for social prescribing. Yet community libraries have been cut by more than 500 under successive Conservative governments. Local authorities have long been underfunded with community centres and other places to socialise such as day centres for older people closed in large numbers. In fact many local authorities are now ‘at breaking point’. Hancock’s vision of a society that is less reliant on drugs seems an unobtainable utopia in the current economic and political climate his government have imposed. Quite staggeringly Hancock has also suggested ‘mix-tapes’ be used as an aid to recovery from illness. Listening to music can certainly be a soothing activity, but it’s a sick joke when viewed against Conservative Party policy over the last decade. The health secretary has not simply floated a few ideas on this subject but has set out plans to expand the idea massively by establishing a National Academy for Social Prescribing where GPs receive training about how the arts can improve health. It has yet to be established how much this new venture will cost, how the benefits will be assessed and what amount of research was done prior to the decision to implement. Matt Hancock asserts ‘prevention is better than cure’, however many preventative services have been cut by his government. Shadow health secretary Jonathan Ashworth highlighted how £34m is due to be cut from substance misuse services, and a third of drug rehabilitation centres have been closed in the last five years alone. This while Britain has some of the highest drug deaths and admissions to hospital for alcohol misuse and Scotland has the highest rates for drugs deaths in the EU. 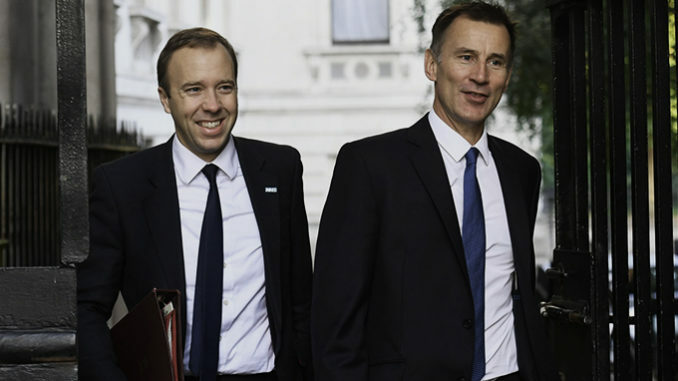 The Health Foundation think-tank has found that overall £700m has been cut from public health budgets affecting services such as weight loss clinics and smoking cessation programmes, since 2014. One cannot advocate for the use of preventative services if they are not provided, and the government should not be penalising patients if the appropriate support is not being offered. Hancock conveniently ignores the impact of austerity on health outcomes over the last 9 years. Studies show that government cutbacks in health and social services have a directly negative affect on the health of the population and have even been linked to thousands of excess deaths in Britain. A correlation has also been shown between social and economic deprivation and smoking, so government cuts to preventative services will negatively affect the poorest most. A joint report by the Office of National Statistics and Public Health England found that a person’s likelihood of smoking increased in line with the level of deprivation in their neighbourhood, and that those residing in the poorest areas of England were four times more likely to smoke in 2016 than those in the least deprived areas. True prevention in healthcare should start with the young, but children’s services have been decimated since 2010. Research compiled by the Save Lewisham Hospital Campaign shows that health visitor numbers across the country have been significantly cut with worrying consequences. The number of children subject to a child protection plan in Lewisham has doubled since 2009. In 2015 401 were on a Child Protection Plan while at the same time social care thresholds have increased, meaning health visitors are often the only professional working with vulnerable children who previously would have been on a child protection plan. This is a prime example of where prevention truly would have been better than cure, but where decreased resources do not make this possible. Research by The Children’s Society found that between 2010/11 and 2015/16, there has been a real terms decrease of £2.4bn in central government funding for children’s services provided by local authorities. British compassion for those who are suffering has been replaced by a punitive, mean-spirited and callous approach. Hancock’s statements are not only fantastical in that the support networks he hopes to shift responsibility for health provision onto have been decimated, in light of what are the well documented effects of austerity, his statements are overtly fraudulent. Worse, they are cruel. Most clinicians in the NHS would happily support a mixture of therapies in combating illness. However, in the majority of cases social prescribing cannot and should not replace established care. This rapid expansion of a programme without the consultation and infrastructure to support it ignores and glosses over several key issues. Crucially, government ministers should ensure that the services they are advocating referral to are sufficient before doing so, as a lack of provision sets patients and staff up to fail. 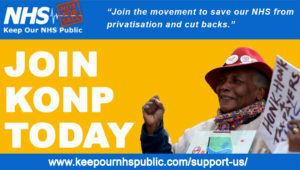 Keep Our NHS Public is the longest running national campaign fighting to save our NHS. You can find out more about us here. By joining us you’ll become part of a community of health campaigners with unparalleled experience and passion, will belong to a nationwide network of activists and have the support of a core team of experienced organisers at a national level. It’s easy and doesn’t cost the earth. Join today.